Brussels Sprout Salad with Cranberries and Pecans, chopped apples and feta cheese with a maple balsamic vinaigrette. This sweet and tangy salad is always a crowd favorite! Whenever we have holiday parties with a large group–potluck style–I always bring a big salad. In most potluck style gatherings we go to, the salads or veggies of any kind are usually scarce. Or, someone may have thrown together a store bought mix of caesar salad or something like that. So, every year when Fall rolls around I have a new favorite salad. It’s true–my husband will make fun of me for it. I get hooked on a specific salad and make it every day for weeks for my lunch. 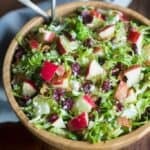 I usually have all of the ingredients in my fridge already prepped–cooked and crumbled bacon, chopped apples with a little lemon juice to keep them from browning, homemade salad dressing, etc–so that I can just grab and toss everything together really quickly for a hearty and healthy lunch. 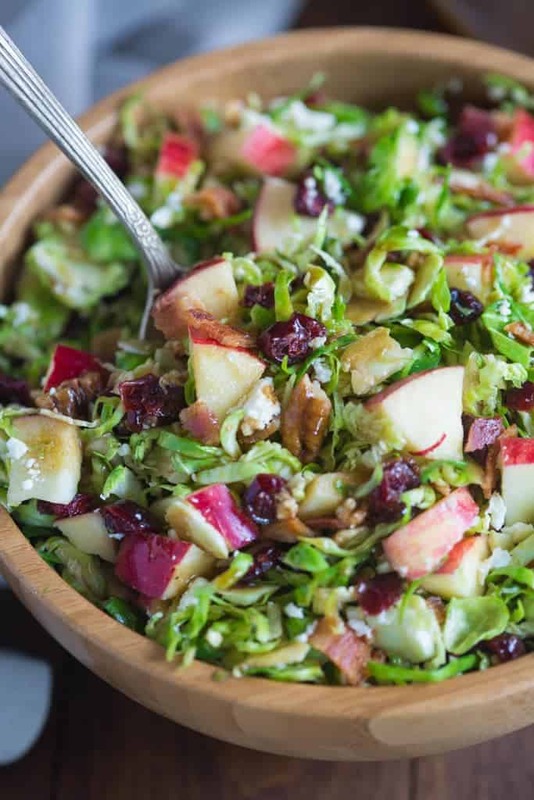 Well, I’m here to tell you THIS ONE–this Brussels Sprout Salad with Cranberries and Pecans, feta, chopped apples and a deliciously easy maple balsamic vinaigrette–is my new salad. It’s seriously addicting. I can’t get enough of it. Brussels Sprout Salad with Cranberries and Pecans, chopped apples and feta cheese with a maple balsamic vinaigrette. Hold the core end of a brussels sprout and, starting at the top, slice it into very thin slices. Discard the core and chop remaining brussels sprouts until all are thinly sliced. 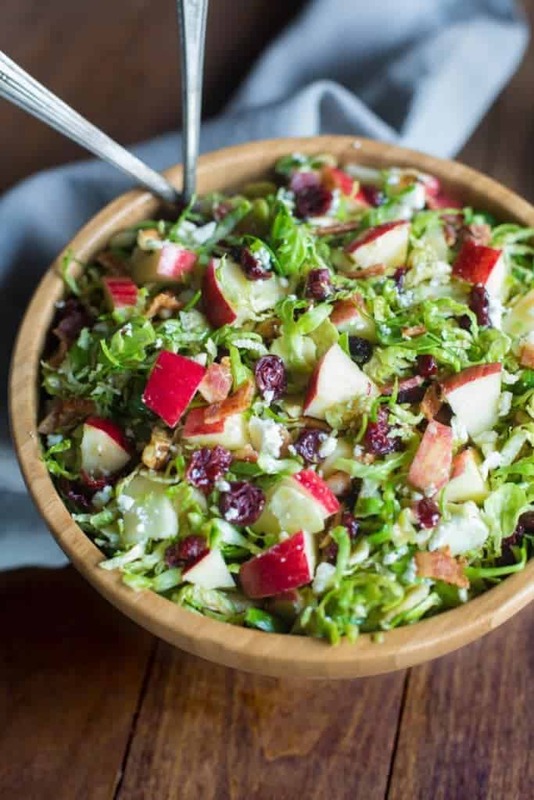 Place chopped brussels sprouts, cranberries, pecans, apples, bacon, onion and feta in a large bowl. For the dressing (can be made several days in advance): Add all of the dressing ingredients to a jar. Place a lid on the jar and shake well. Pour desired amount over the salad, a little at a time (you may not use it all! ), until coated. I love brussels sprouts but I had never shredded them for a salad. It was delicious! Absolutely Delicious!!!! So Healthy too!! !